Once upon a time, there was a lonely girls who was always sad. She did not have any friends and was always by herself. Her house was surrounded by woods, and this is where she would hang out and play. Her name is Paiven. One day, when she was outside exploring the woods, she found the most amazing tree! It was so different looking, but really beautiful. Every day, she would sit by the tree and talk to it like a friend. One day, when she was sitting by her tree, she noticed something. It looked like a tiny doorknob. She reached up and turned the knob. A little door opened! Inside the three were a chairs, a table a sign that read, “Make a wish.” She wished for friends. But, nothing happened. 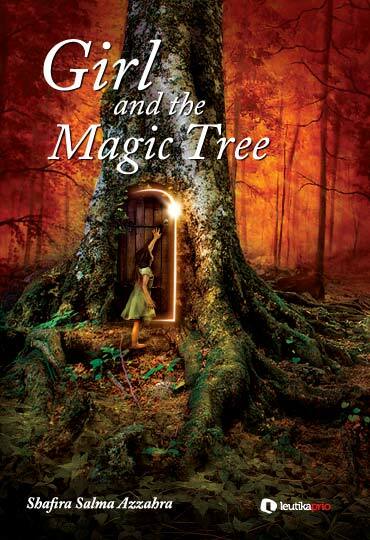 Girl and The Magic Tree adalah kumpulan cerita-cerita pendek yang jujur dan menyegarkan. Karya tangan mungil Shafira Salma Azzahra ini akan membawa kita kembali ke ruang imajinasi khas anak-anak, yang ternyata demikian kita rindukan, berapa pun usia kita sekarang ini.